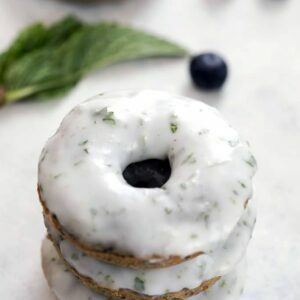 These Blueberry Mojito Doughnuts take the classic flavors of a mojito and turn them into a cocktail-themed treat that’s perfectly acceptable to enjoy with your morning coffee. Do you know what the best part about working from home is? I don’t have to get up at the crack of dawn to “get ready.” I’ve never been one of those people who can get up in the morning, throw on clothes, and be out the door in 10 minutes. I need a good hour+ to get ready, in part because rushing in the morning is not something I can handle. I like to enjoy my cup of coffee and ease into the day and would rather set my alarm for 45 minutes earlier than wake up and have to run around like a crazy person. Now that I work from home, I still get up early and am out the door to take my husband to the train, but I don’t have to do my hair (or even wash it… thanks to dry shampoo!) or put makeup on to do that. I still get “dressed” in the morning in that I change out of the clothes I slept in, though admittedly usually into yoga pants and a tee shirt (some people can only work well if they put on “real” clothes; I can only work well if I’m comfortable). But other reasons I love working from home include having my dog by my side nonstop, afternoon walks and lunch dates, and just the fact that I can fully focus on my work with limited interruptions. Now that the weather is getting nice, I’m excited that I can actually enjoy the sunshine during the day instead of being stuck in an office all day. The only problem? A nice sunny summer day often has me craving a cocktail. And while I totally have the freedom to sit on my deck with a cocktail at 11:00 a.m.if I want (especially if I happen to be testing a cocktail recipe that day! ), it’s probably not a good habit to get used to. But cocktail flavored doughnuts? That’s a habit I’m OK getting involved in. 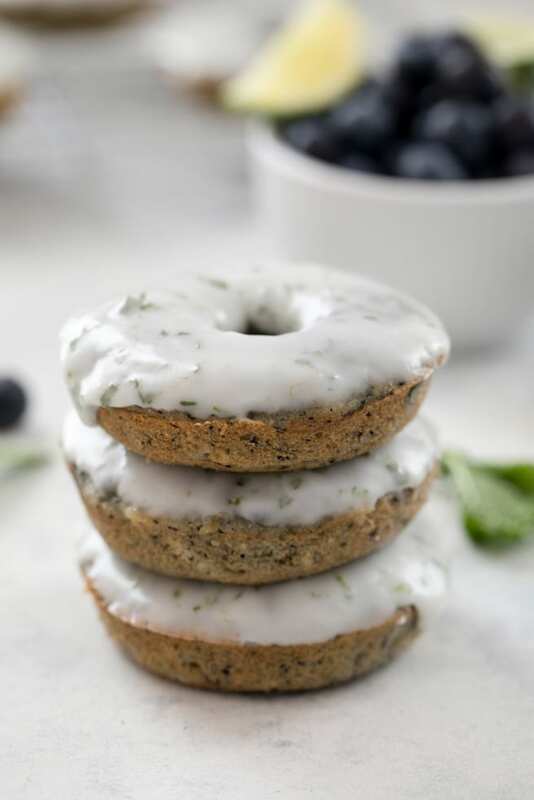 I always say there’s no bad time for a mojito, but I may have to refine that statement to include “except for with your morning coffee.” Which is exactly why I developed these blueberry mojito doughnuts. The batter for the blueberry doughnuts starts with a blueberry mint puree, which is literally just blueberries, chopped mint, and a little bit of granulated sugar. That puree gets folded into the doughnut batter, which turns it an ultra pretty blue. 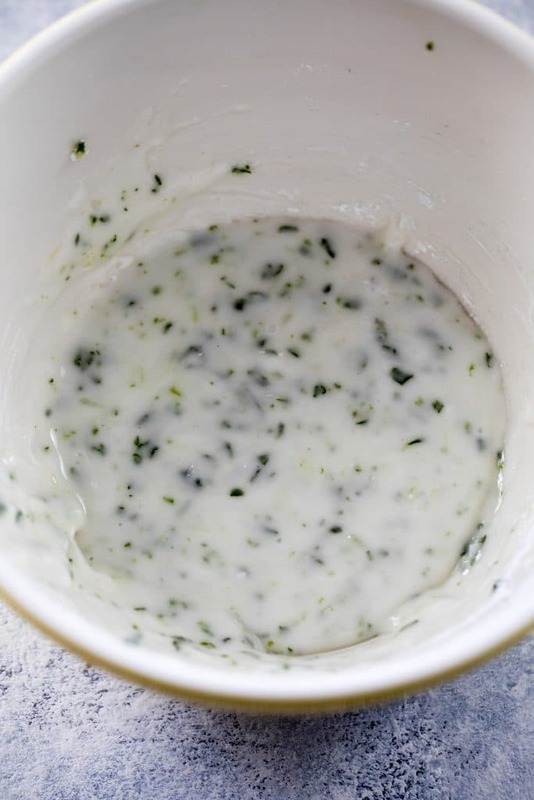 While the blueberry doughnuts are baking, you’ll whip up a mint lime icing, which literally consists of putting all the ingredients in a bowl and whisking into a glaze. 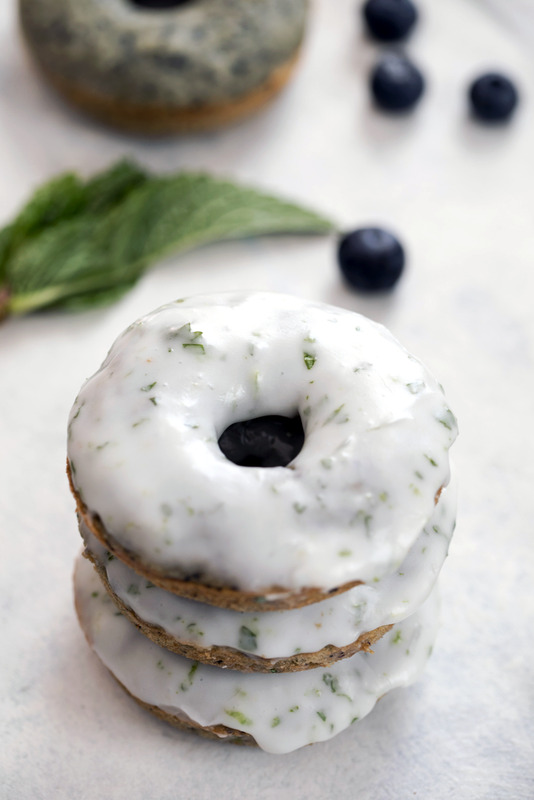 The icing turns these blueberry doughnuts into blueberry mojito doughnuts. My favorite part is dunking the tops of the doughnuts into the glaze, lifting them up, and letting the glaze drizzle down. The first time I made these, I simply drizzled the glaze over the doughnuts, but this time I dunked them. Such a good decision. You want those doughnut tops to be completely coated in the mint lime icing! And… enjoy. Doughnuts and cocktails have to be two of my favorite things in the world (doughnuts and coffee are up there, too), so this is obviously a marriage made in my own little personal heaven. Though I have to say, it also had me craving a real actual blueberry mojito. I have recipes for Frozen Blueberry Moscow Mules and Blueberry Vodka Lemonade, but no blueberry mojitos! Now I’m wondering what it would be like to dunk these doughnuts into a mojito. Help! Probably amazing, but also sinful in some way. Must. Practice. Restraint. But ugh. Restraint is boring. And really, why bother practicing it on doughnuts? Especially blueberry mojito doughnuts. That sounds like a silly idea. I say this all the time, but if you’re going to bake a doughnut instead of frying it, you better be darn certain it’s incredibly moist and fluffy. I think the blueberry purée really helps achieve those goals here. And the mint helps achieve the goal of awesome. OK, that sounded lame, but you know what I mean. What’s a mojito without mint? Er, not a mojito. Duh. I didn’t add any lime juice into the actual doughnuts, which is why I made certain to include a very healthy dose in the icing. 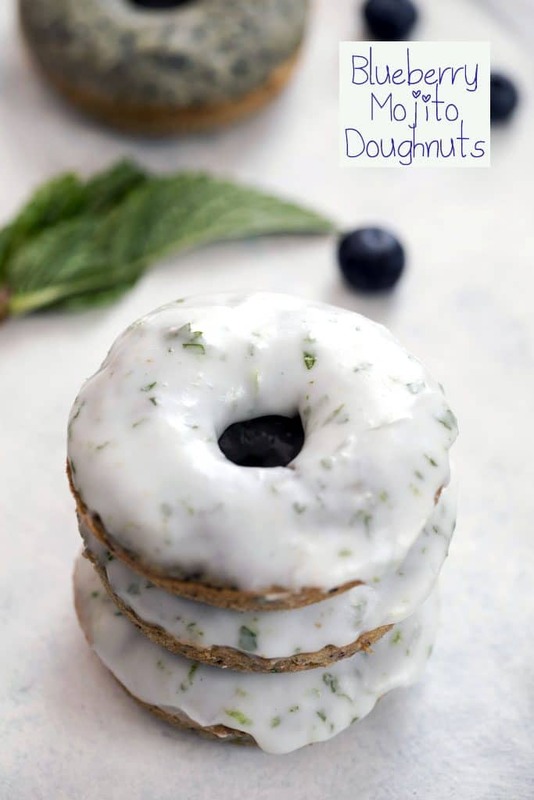 It ended up being a really good idea as it made the mojito doughnuts even more refreshing than they were icing-free. Note that there is no rum in these doughnuts, which I suppose is also a pretty necessary mojito ingredient. 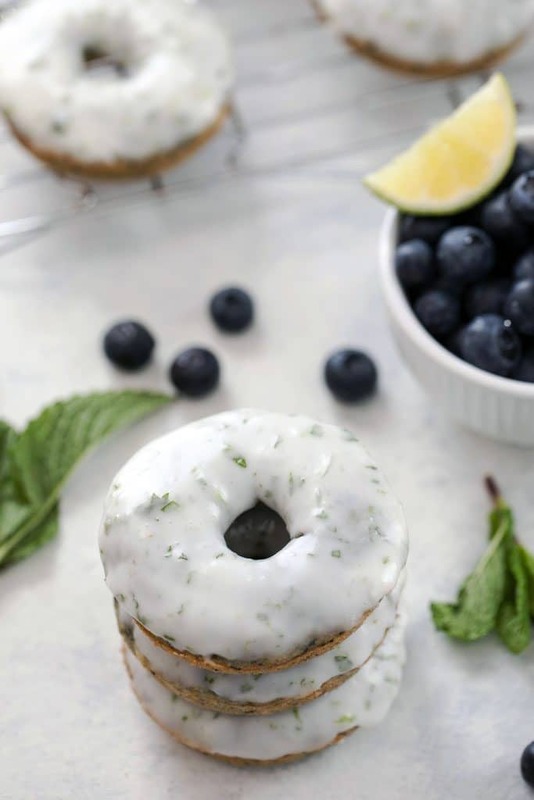 But think of these as virgin blueberry mojito doughnuts. And feel free to add a little rum to the icing if you’re enjoying these in the afternoon (though seriously, no judgement from me!). Sooo, if you stop by my house on a weekday in the summer, you may just find me sitting on my deck with my dog in yoga pants, no makeup and unwashed hair. But I’ll totally offer you a cup of coffee and a blueberry mojito doughnut and we can sit and chat and enjoy the sun. And I mean… Doughnuts and dirty hair? I kind of want that to be the name of my someday band. Also, thank goodness for dry shampoo. #amen. Cocktail or doughnut… You can only have one. What do you choose? 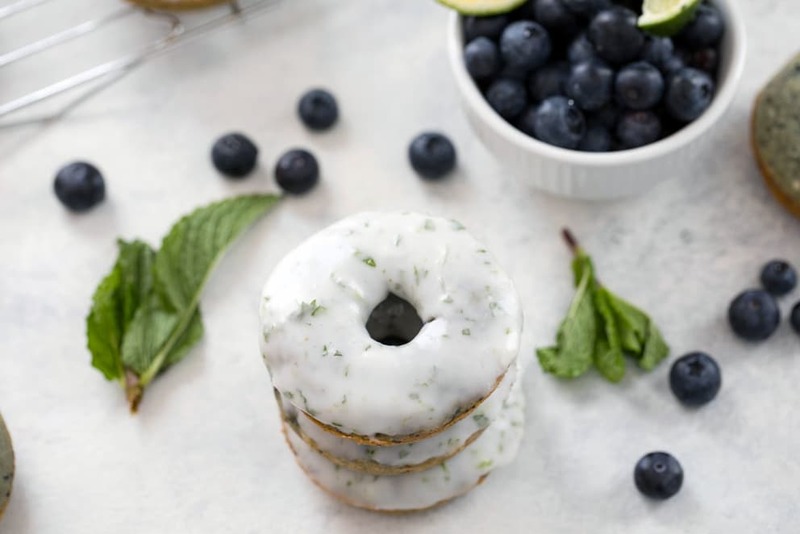 These Blueberry Mojito Doughnuts take the classic flavors of a mojito and turn them into a cocktail-themed treat that's perfectly acceptable to enjoy with your morning coffee. Pre-heat oven to 350 degrees and lightly spray or brush a doughnut pan with cooking oil. 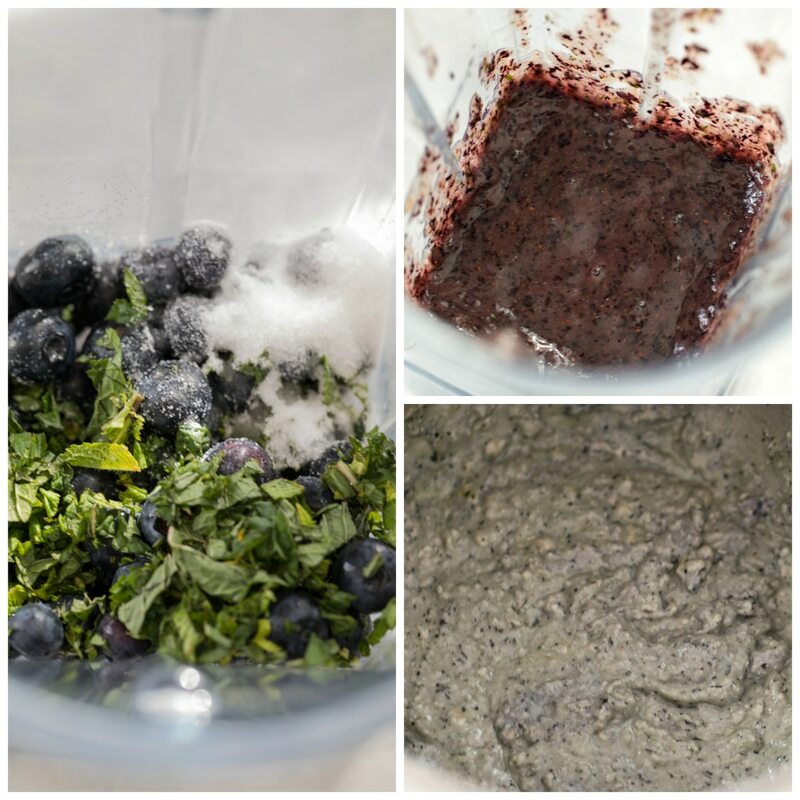 Put blueberries, mint leaves and 1 Tbsp sugar in a blender. Blend until puréed. Set aside. In the bowl of a stand mixer, beat together the butter and remaining sugar until light and fluffy. Add the eggs and mix to combine. Gently stir the flour mixture into the butter and sugar mixture, alternating with milk. Then stir in the blueberry purée and vanilla extract. Take care not to over-mix. Evenly distribute batter in a lightly oiled doughnut pan, filling tin almost all the way. I recommend putting batter in a Ziplock bag, cutting off a corner, and piping batter into the doughnut pan. Bake for 12-14 minutes, until doughnuts are light and springy and just beginning to turn golden at edges. Remove from oven and let rest in doughnut pan for a few minutes, before removing to a wire rack to cool completely. When doughnuts are completely cooled, dip them in lime mint icing to coat tops. Allow the icing to cool and harden. Whisk together all ingredients together in a medium bowl. 27 Responses to "Blueberry Mojito Doughnuts"
My life has been so much better since I discovered I don’t have to wash my hair as regularly as I thought. Also, dry shampoo is so much fun. Dunking these in an actual blueberry mojito is a grand idea! They are so pretty!!! Bah, getting ready takes soooo long!! WAH! I love these donuts…the flavour is awesome! What a fun flavor, Sue! Such a creative donut. Looks delish! Talk about a doughnut you won’t find at the corner doughnut shop. Yum! I Totally agree with you girl!! I sometimes do that to since extent, like today I woke up, changed and ran to get my mother’s hair colored!! BTW blueberry mojito doughnuts?!! Are you kidding!! I want these! I wish I had one of these donuts to go with my coffee this morning! 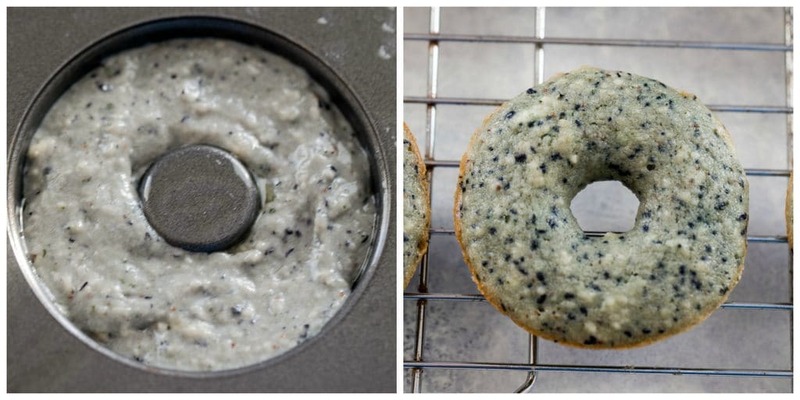 Now these aren’t your typical blueberry donuts! Love the addition of the mojito flavors! These donuts are the best way to have cocktails for breakfast! So ready for a lazy Saturday morning… and I’m going to want some of these doughnuts to go with it! I think I’d choose a doughnut over a cocktail… but really it probably would be an in-the-moment decision! OMG these donuts are so much fun! I actually just discovered how to effectively use dry shampoo and have definitely taken advantage and washed my hair less often. I think it’s actually better for your hair that way! I recently started using dry shampoo and I love it! It was a miracle for my mornings being able to skip shampoo days too. I would be all about sitting outside with a plate of these and a monster mug of coffee – such a unique (and delish-sounding) donut flavor. Our mint plant has been super lush so I’m always looking for ways to use it up! Somewhere along the line I aslo learned that washing my hair everyday was not necessary-definitely saves time. These blueberyy mojito doughnuts rock!! I think every female who read your comments about getting ready is nodding her head. I am older and keeping my hair healthy is extra important. My hair gets wet, but I only use shampoo twice a week. I always let it dry naturally. Yes I work a day job. I just get up earlier to allow that to happen. I don’t want to bake my hair everyday. I too love the days when I allow myself to wear my bathrobe all day. It doesn’t happen as often as I would like. So I guess it makes the days it does happen all the more special. Like these SPECIAL doughnuts. Gad I love doughnuts! I totally WISH I were one of those girls that could just wake up and be ready to go lol…but until that time comes, I’d love to enjoy one of these lovely looking doughnuts each and every single morning! Pinned it! These looks so yummy! I do enjoy making doughnuts but haven’t tried baking them before. I feel like I should invest in a doughnut pan and try these out! Less calories right? So they’re healthy then! haha. I know exactly what you mean! I get so jealous of men that they don’t have to bother with makeup and their hair is so short, it hardly requires any work. I wash my hair every other day and sometimes I wash it at night to save some time in the morning! I’m all over these doughnuts. They sound like the perfect breakfast with my coffee! I loooove baked donuts! These look fantastic! I can’t think of a better way to start out my day. Mint and blueberries. YUM!!!! Thanks for sharing. Mint, blueberry, and lime is such a fantastic combination! Love these doughnuts! These definitely achieve being moist and fluffy in spite of being baked! They are perfection! Plus I love when delicious food is also pretty! These sound awesome! I was kinda sad there was no rum involved, pulling the ol’ bait n’ switch on me. But they still sound like amazing doughnuts! Will try this on the weekend and hopefully my kids like those amazing doughnuts.